Cut chicken breast medallions into thirds and transfer to a bowl. Season with salt and add freshly grated orange zest and grated ginger. Set aside. Halve small cooked potatoes, cut broccoli into florets, slice zucchini, and halve the mushrooms. Place all into separate serving bowls and set aside. Finely chop garlic and add salt. Use the side of your knife to press the garlic against the cutting board and create a paste. Mix garlic paste with half the mayonnaise. Mix the other half of the mayonnaise with the grainy mustard. Season both with salt and fresh lemon juice, and season the mustard dip with pepper. 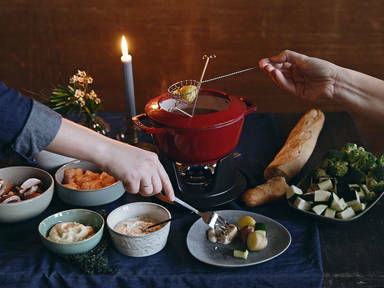 In a fondue pot over medium-high heat, boil the beef stock and thyme. Transfer to a fondue burner for serving, if desired. Cook the chicken and vegetables in hot broth and dip as desired. Enjoy with baguette!